Have you checked out Almost Human? Almost Human is a sci-fi/crime drama set in 2048. Although it is only in its first season, I am super impressed with this show. 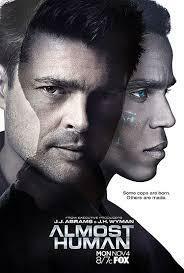 It stars Karl Urban (Bones in the JJ Abrams Star Trek adaptations) and Michael Ealy. Urban plays a detective who is just returning to the force after an injury that left him with a robotic leg. He is partnered with a decommissioned android played by Ealy. Those who loved Data in Star Trek The Next Generation will adore Ealy’s character, Dorian. Have you watched Almost Human? What did you think? I was introduced to this show while visiting my son and his wife. Although it's not the sort of show I would normally go for I like the interaction between the two main characters so I will keep watching. Saw the 1st episode with my husband. I didn't find the series gripping, he watches it though. I honestly didn't find the first episode that gripping either, but I did see the potential, and as the series went on, I really thought that potential was realized. Not seen it - sounds a little like Robocop? I'd never heard of it. It sounds interesting. No, but my husband and I watched Real Humans the other night on SBS. We shat our pants. Do you have a favourite made-for-TV Movie? What show are you really enjoying this TV Season? Which big-screen star would you love to see on the small screen? What show are you most excited to have return after the Christmas break? Are you excited for Colin Farrell to join True Detective? The Trailer for Edge of Tomorrow looks Incredible!